The Instant Pot is an amazing piece of equipment, and nothing impresses me more than the speed and ease with which it renders oxtails into perfect specimens of smooth, silky, beefy goodness. What normally takes 2-3 hours of simmering, the Instant Pot does in 35 minutes! This recipe is very adaptable; feel free to play with seasonings, herbs (rosemary? basil? ), liquids (juices? broths? ), even vegetables. The key is to have enough liquid to just cover the meaty morsels. The resulting stock will be like liquid gold. 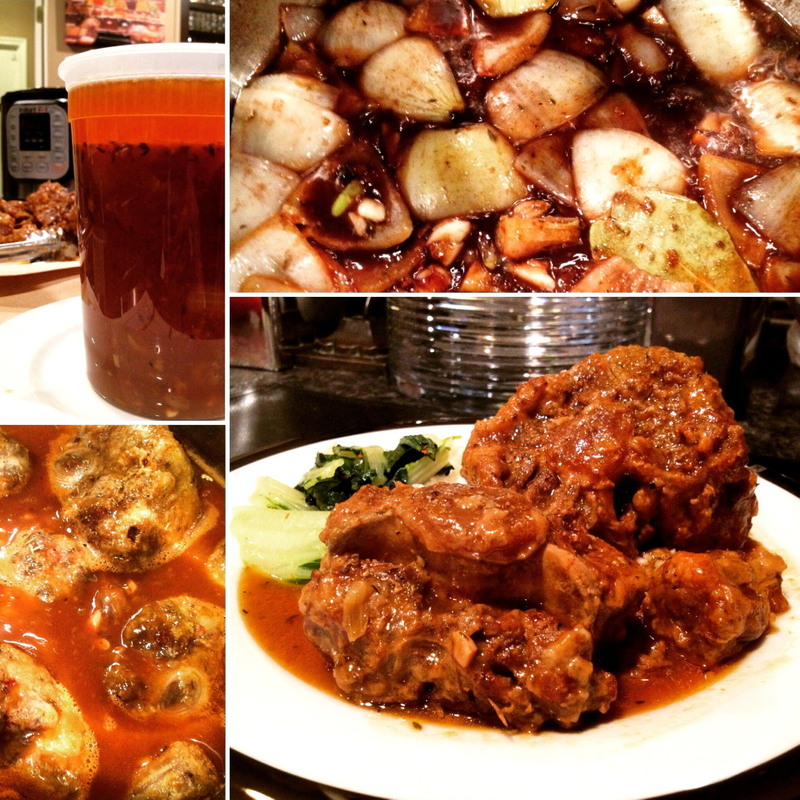 Oxtails have a tremendous amount of collagen, which imparts the cooking liquid with an amazing flavor and mouthfeel. Don’t waste a drop of it! I defat the liquid by pouring it into a tall, cylindrical soup container, and letting it rest a bit. The fat rises to the top, and is easily ladled off. Store this flavorful fat in a covered container in the fridge, and use as a base for gravies, to saute vegetables, even to make your next batch of oxtails! Place oxtails in a large colander in the sink. Bring a large pot of water to boil. Carefully pour over oxtails, turning large pieces to coat. 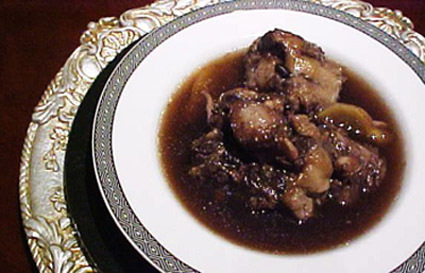 Rinse oxtails with cold water, washing away any impurities. 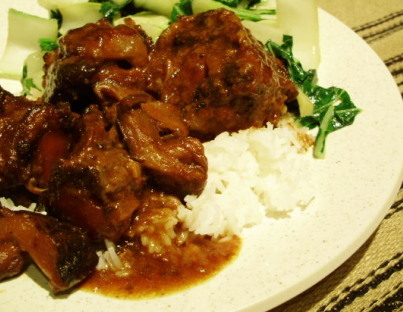 Pat oxtails dry and place in large bowl. Season oxtails liberally with salt and pepper, and the paprika and garlic powder. Dredge in flour. Heat Instant Pot on Saute. When “Hot,” add oil and heat to barely smoking. Brown oxtails in batches, turning to brown evenly. Remove browned pieces to a dish. Add onion to Instant Pot and cook, stirring until slightly brown, adding more oil as needed. Add garlic, brown sugar, bay leaf, thyme, and oregano. Stir until fragrant, about 30 seconds. Add wine, and stir to deglaze pot. Bring to a boil and reduce slightly, about one minute. Add tomato sauce, one cup of stock, soy sauce, Worcestershire sauce, and balsamic vinegar. Return to boil, nestle oxtails in pot, and add additional stock to barely cover oxtails. Lock lid in place and cook on Manual for 35 minutes. Release with NR. 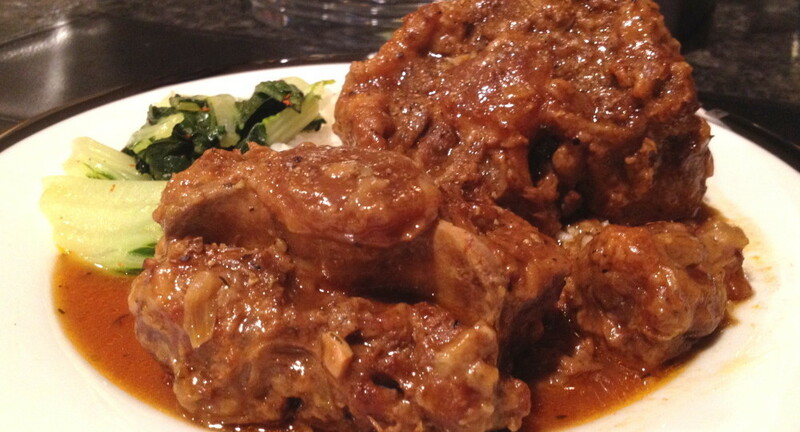 Remove oxtails to serving platter. Reduce liquid slightly on Saute and defat. 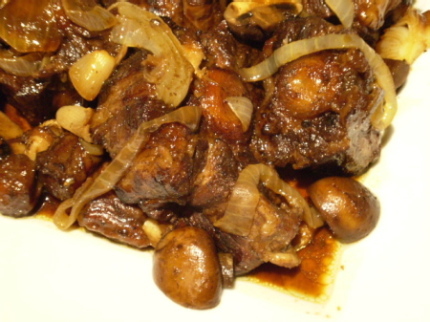 Correct seasonings and spoon over oxtails, serving with rice, polenta, or pasta. Note: I found that the medium sized oxtail pieces cooked perfectly in the 35 minute time. Larger pieces (such as in the featured photo) may take a bit longer, but I prefer braised meat to NOT be “falling off the bone” tender, just pulling away from the bone, but still with some “bite.” If you prefer your oxtails cooked a bit further along, simply remove the smaller pieces, reseal and reset the Instant Pot for five minutes more, then NR. DH requested oxtails for Thanksgiving as he is not a fan of turkey. So this will work perfectly, as I do like turkey and we will be having both.